In 1956 a clause was added to the British Road Traffic Bill so that owners of dogs allowed on a ‘designated road’ without a lead would be liable to a fine of up to £5. This sign, near the entrance of Sydenhams, shows that Ock Street in Abingdon was such a ‘designated road’. It must be the oldest dog sign in Abingdon and dates from before the Borough ceased to exist in 1974. Unless you know better. Wonder why the painter painted the B and the A in blue. 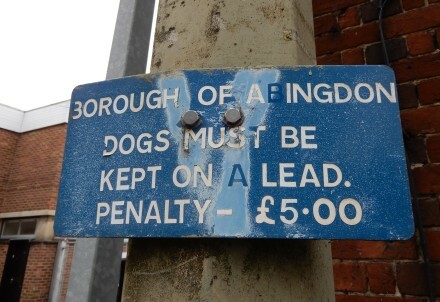 I can remember Abingdon before the Council had a dog warden. People used to throw their dogs our to roam. There were three aggressive alsations terrorising people outside Reynolds Way shop. The police were called. They came and looked at the dogs and then drove off. The council had to put another exit into our back road as a neighbour was attacked by anothers bull dog when she went to the shops on her bike. Since the dog warden we do not get any of this, although there is a problem with dog owners throwing dog poo bags in hedges and trees. It would be better to have left the poo on the ground to degrade. i can remember as a kid walking through hogarth place and being followed the entire length of the road by about 6 barking dogs – pretty terrifying for a kid. they never actually tried to bite me but even so…. one did try (as i decribed to my parents when i got home much to their shock) dancing with me as she stood on her hind legs (!) one time. Didn’t dog poo used to turn white? I wish it did degrade when left un-scooped instead of getting on shoes, trodden into houses, let alone being a danger to health, particularly for children. Suspect stick on letters. The adhesive failed revealing the true blue colour of the paint/enamel underneath.